A-Z of Embroidery Stitches 2 Winner! I suppose, if you signed up for the give-away, you’re probably reading this just to find out if you won, so I won’t spend lots of time explaining how I do give-aways (which I’ve explained in detail on previous give-aways), or reflecting on the glories of this particular book (or any other book, for that matter), or elaborating on the Current State of the World, or even the Current State of My World (which, incidentally, is rather a disorganized mess right now). No, no. I suppose I should just get down to the Nitty Gritty. And the Nitty Gritty is: Who Gets the Book?? So that’s the Nitty Gritty, in case you didn’t win, and are interested in a copy of the book! But who did win? The winner is…. CecilB! Congratulations, CecilB! In order to claim your your book, please contact me with your mailing address within 48 hours. If I don’t hear from the winner, I’ll draw another name. 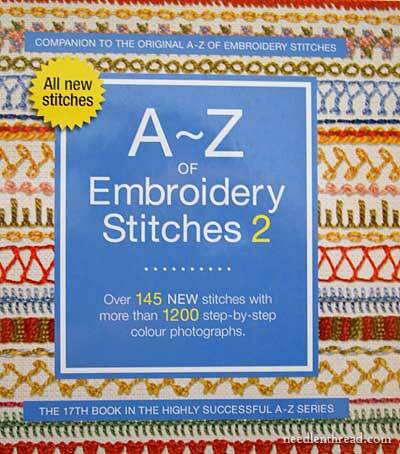 July 21, 2010 A-Z of Embroidery Stitches 2 – Giveaway! Congratulations, CecilB! Enjoy the book. Mary if you dont mind will you give the name for the stitches from the cover of the book please.. fourth from the top row(blue colour thread) and 4th from the bottom row(yellow coloured)..
Hi, Lakshmi – The fourth one up in yellow is knotted diamond stitch – you can find my video for it here: Knotted Diamond Stitch and the blue one is called “bonnet stitch” – but it’s worked upside-down, I think. Well, I’m pretty sure it’s bonnet stitch, anyway…. Congratulations!! !CecilB… Enjoy your gift…I’m sure its a treasure.. I too liked the book very much and wanted to have a copy of it.. But didn’t sign up for the give away coz I went busy and couldn’t make it.. but no regrets and happy for u also.. Thank you so much..I am really really happy with your prompt reply..
Congratulations CecilB, Enjoy your gift.I am sure you will have many happy hours using your new book. Congrats CecilB. I got a chuckle out of reading the blog, reading, reading, looking for the winner’s name. Big build up there. Talk about having a very good day! Enjoy the book. And good on you CecilB. “I really would LOVE to add this book to my library!” Well now you can. Have fun with it. Congratulations. Boy! Weren’t their a lot of entries. How good is that! Pages and pages. Took some looking to find the winners comment I tell you. Interesting reading though, although with so many I just couldn’t read every one. Just wanted to let everyone know that the price at Wooly Thread is up to $33 as of June 2013… and it’s $59 at Amazon! Next Next post: Elementary Embroidery: Online Book – Free!